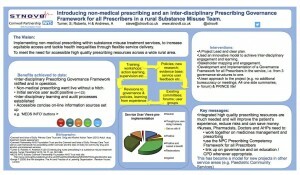 Facilitating the development of non-medical prescribing (nurse prescribing) in a mental health trust. This included setting up a Peer Supervision Group in an NHS Trust, and the successful establishment of a South West Regional Non-medical Prescribing Leads Group. This group is running strong 5 years since its inception.